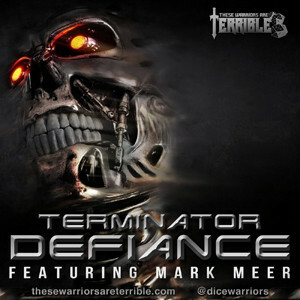 After barely surviving their encounter in the Skynet ruled Future, our Terrible Warriors, Steve, Scotty, our GM Mike and special guest Mark Meer sit and talk about their adventure! In the conclusion of our ConBravo episodes featuring special guest, Voice and Improv Comedy Actor Mark Meer and the Terrible Warriors face down Skynet in a battle of life and death. Will our Warriors reach the Resistance? Will they get back home? Or, will they take down Skynet once and for all? Listen to find out! Our Terrible Warriors are Back from our trip to the future and boy are our arms tired! You'll see what we mean. During our recent appearance at our favourite local Convention ConBravo this past July, our Terrible Warriors got a chance to sit down and play a special RPG with a very special guest. Joining Mike Dodd, Steve Saylor and Scotty Bordas was none only than Commander Shepherd from Mass Effect Mark Meer! Led by our GM Mike Dodd, Steve, Scotty and Mark are a small group completing a military operation to take a trip to the future to steal technology, materials, anything we could find and bring it back to the present. Did we succeed? Listen to find out!